Planning a wedding can be a daunting task. There is so much to consider – practically as well as emotionally – and so many different people to consider. But it needn’t be a huge stress. There are plenty of guides out there, in addition to professional wedding planners (if you’ve got the cash), and in our experience if you get the reception and food right, everyone’s happy. With that in mind, we’ve hunted down 7 different minimalist, beautiful ways to dress your wedding table and make your big day simply perfect. For a colour palette, think muted greys, blush pinks, sage green foliage and softly textured white linen tablecloths. Linen is the perfect backdrop for an informal theme and won’t take centre-stage, leaving centrepieces and wedding cakes to shine in their own right. And the happy couple, of course. Texture will add interest to a minimalist look, so add sculptural flowers like thistle, seddheads or ornamental cabbage to bring an arrangement to life. Use off-cuts of small branches and have guests’ names engraved or etched into them (or do it yourself if you’re handy with a blowtorch!). Place on a plain linen napkin and tuck a sprig of olive or rosemary behind for a stylish yet pared-back look. 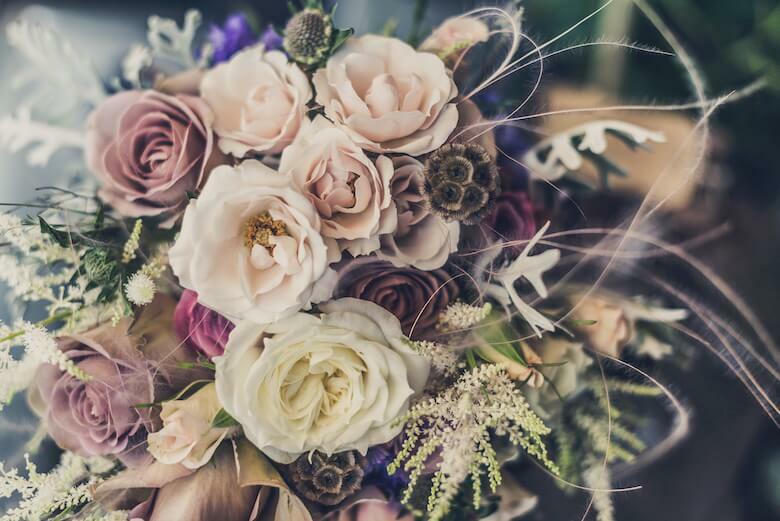 Filled with local wildflowers or just simple froths of gypsophila, jam jars wrapped with a few strands of string are perfect containers for a rustic/ country-feel at your wedding. Festoon lights are going to be huge again this year. We love this combination of romantically-coloured dried hydrangea heads hung amidst bare bulbs. So sweet! If you are keeping your table bare, consider placing clusters of large pillar or church candles along the centre, in a higgledy-piggeldy way. These glowing candles look so beautiful agains the grey of the table, and add softness to the layout. Gold cutlery looks amazing with chunky white candles. 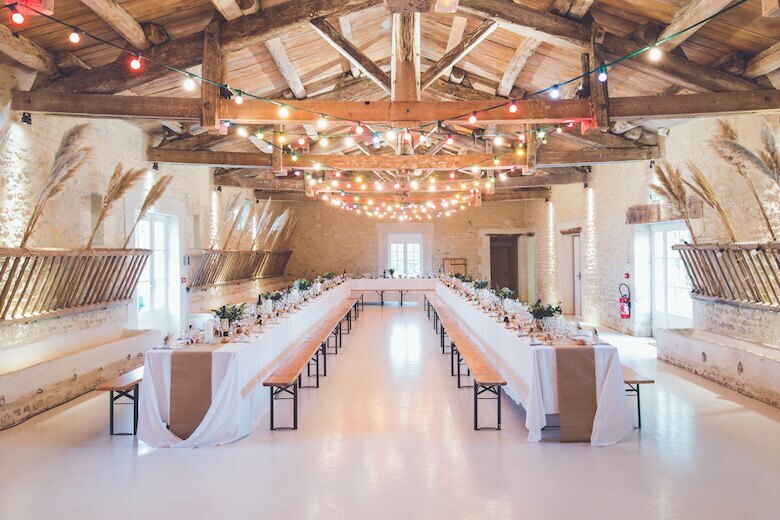 For a really pared-back look you could use clear ‘ghost’ chairs, which will allow the focus to remain on your tables and help to make the reception room feel decluttered and clear, despite all the revellers. Take advantage of seasonal florals and weave white tulips, ferns and other foraged greenery into simple wreaths that are suspended above the tables. And, for a bit of fun, we love these customised Mr and Mrs Converse Chucks specially made for the happy couple to throw some moves on the dance floor without resorting to bare feet! For information on bespoke, custom made linen tablecloths, go here. Because we know that all wedding tables, from rustic benches to traditional round tables, are not made the same. Got any advice for anyone planning their big day? Share with us in the comments below.